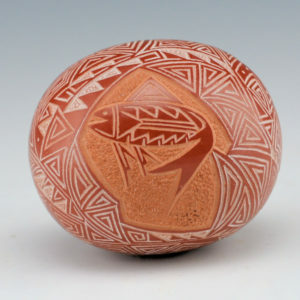 Art Cody Haungooah (1943-1985) is remembered for his innovative take on traditional Pueblo pottery. 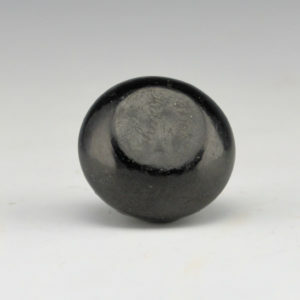 Since the height of his fame in the late 1970’s and early 1980’s, his name, unique design style and early passing has given him a certain enigmatic quality. 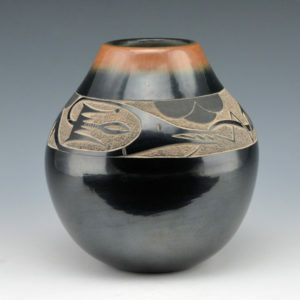 For those who remember, he began making pottery at a time when his work was often compared with that of Joseph Lonewolf. This article is a moment to look back at his life, and career. More importantly it corrects some errors in dates and provides accurate researched information and context about his life and art. Luckily, there is just enough source material about Art and Martha from the pinnacle of their fame until their untimely deaths to help put their amazing pottery once again into perspective. 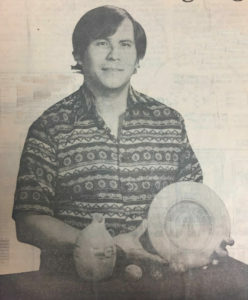 Shining a light on Art’s brief career is timely, as a non-pueblo artist making Santa Clara pottery, he speaks to current trends in the Native art world. 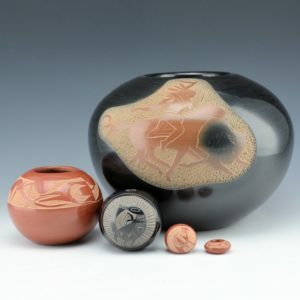 While only creating pottery for around a decade, it now possible to reflect on his work from a distance in time and consider his fame and impact today. Art Cody was the grandson of the famous Kiowa medicine man and scout James Haungooah, also known as Silverhorn (1861-1941). The first Haungooah became famous in the 19th century for his ledger drawings of life on the Southern Plains. 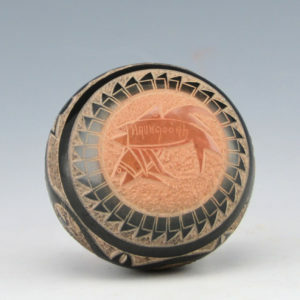 The name Haungooah means “sunlight reflecting off a buffalo horn”, or “Sliverhorn” in Kiowa. Martha Suazo (1947-1981) was a daughter of potters Joe and Santonita Suazo. Here sisters were Mae Tapia, Shirley Duran and Candelaria Suazo. She learned to make pottery from her mother and today, her surviving sisters continue to make pottery. Art and Martha met in Dallas, Texas, when he was stationed at Fort Hood and she was attending school. 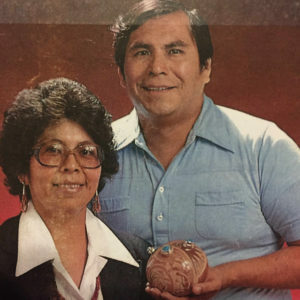 They were married in 1972, moved to Santa Clara Pueblo and began making pottery together that same year. Their son Dean was also born in 1972 and they also had a daughter, Yanavia. 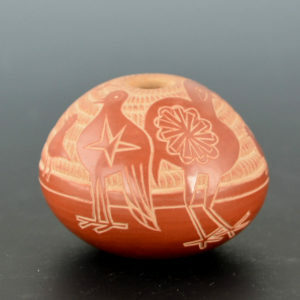 Martha would make and polish the pottery while Art would sand the pieces before polishing and then after the firing etch and carve the designs into the surface. 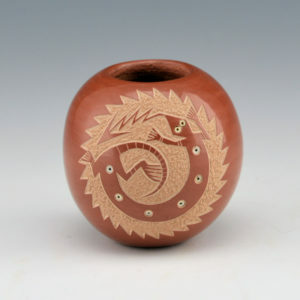 Art received his Associate of Fine Arts degree at the Institute of American Indian Art (IAIA). 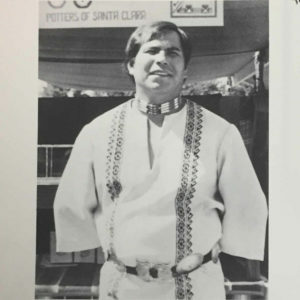 He learned not only pottery techniques, but how to set stones, make jewelry and do silver work. 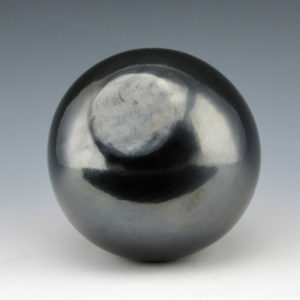 There are examples of his later pottery which includes pieces of silver as part of the design. 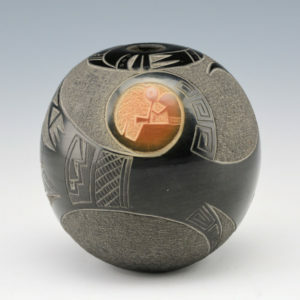 He also created paintings, stone sculptures and bronzes during his career. His time at IAIA was transformative and created an exposure to a variety of art styles, both native and non-native, and these influenced the contemporary direction of his artwork. Art Cody Haungooah, Miniature to Massive, and all the sizes in between. 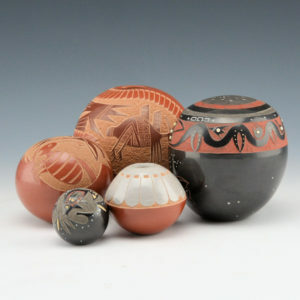 Art and Martha created a unique blend of designs on both miniatures and larger vessels and they were an immediate sensation. 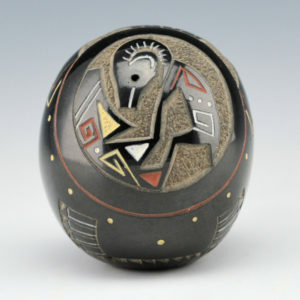 In 1976 Haungooah said of his clay art, “I’m experiencing with the pot, in a manner similar to a painter, the subject matter, at a given moment is captured and the impressions and thoughts become living symbols and a living composition is created and recorded. In the future I will surpass my present work and create artistic works of greater quality“. By 1978, their work was described as, “dynamic, manneristic, impressionistic, abstract and realistic all rolled into one“. 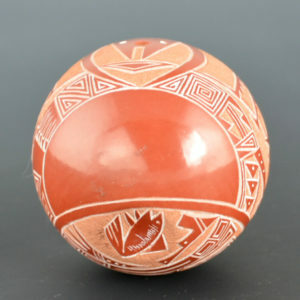 The unique fusion of Kiowa and Santa Clara designs continues to give his work a unique appearance, separating it from other pottery of the time period and even today. 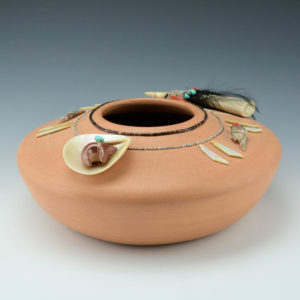 Art said, “Something new is going on in pottery; pottery is becoming a format for releasing designs and ideas just like on canvas. This represents a total break from tradition in design. And why not?“. In In 1979, an exhibition was organized at the request of Pierre Cardin through the Hukahee Fine Arts Gallery of Scottsdale, Arizona. There were ten Native American artists including Kevin Red Star, Parker Boyiddle and Doug Hyde. Art and Martha were chosen to travel to Paris in conjunction with the exhibition at Espace Pierre Cardin. 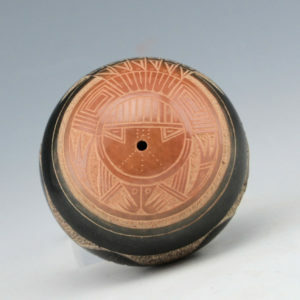 Martha said that she was fascinated by miniaturization in Pueblo pottery. She commented that she had, “pottery hands” and that, “I like to make the pottery with thin walls”. 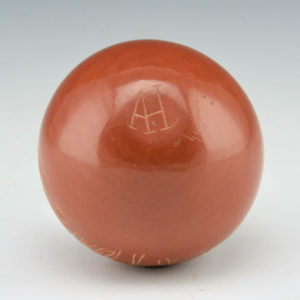 Martha initially would make and polish the surface of the pottery. Art became fascinated with the pottery and together they began working together. 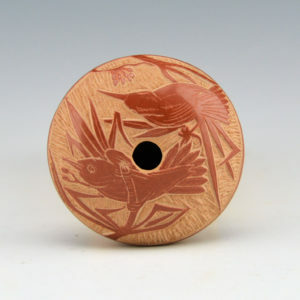 Art would sand the pottery and then etch the designs into the clay after the firing. 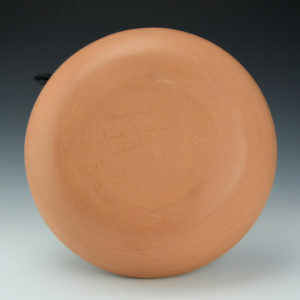 He did make some of the pottery prior to 1981 and they were often asymmetrical shapes. 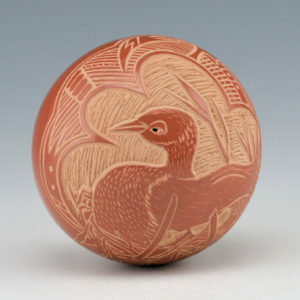 When etching into the clay, Art would sit at a table and use a magnifying loop over his eye as he would design each piece. Why so many miniatures? Art said, “I can make twice the amount of money by making miniatures. There’s a bigger demand for miniatures, and they’re not that time consuming, because there’s a smaller area to work with. The larger pieces you put more time into it, and then if they do sell you’ve got to sit back and wait for a buyer to come in”. Contemporary or Traditional, Classic or Post-Tribal? Art was very forward thinking about the whether the art had to be tied to tribal affiliation. “I don’t see any sense in it. There’s no individual tribe, no individual thing anymore. We’re all being influenced by each other. We all influence. I don’t think you can stand on traditionalism anymore. We are always exposed to different cultures, different life styles and sooner or later you’re going to absorb a little of that”. This was certainly a somewhat provocative stance for the time and yet one in which many of today’s artists are taking as an artistic mantra where they are not locked into a set artistic paradigm and draw from all their life experiences. 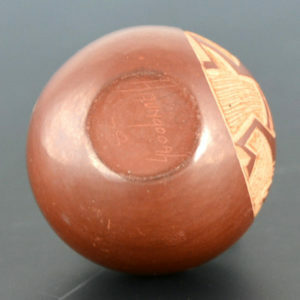 The designs on their pottery were initially derived from Santa Clara pottery. The avanyu and feather patterns are among the most classic. 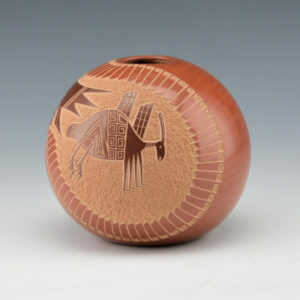 Art also referenced the pre-historic Mimbres pottery from the 1100’s for designs on his pottery as well. Some his imagery certainly comes from his Kiowa background and their cultural stories. What is interesting to note on his work is not only the choice of imagery, but the way it is put together. Early on Art used the classic linear placement of designs on the pottery. However, this quickly evolved and imagery flowed from top to bottom or in bursts of patterns on the surface. Simple medallion designs might also be set with color dots to enhance the pattern. 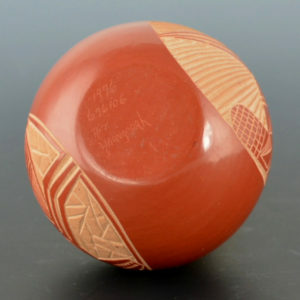 Art said of his designs, “My basic designs are derived from simple curves and angles and straight likes like the Hopi use.” As such, Art’s use of designs that are non-pueblo or even non-Kiowa would seem to classify him as a “non-traditional potter”. One distinctive outside influence on Art’s designs was M.C. Escher. Art said of his work, “I love his ideas with insects. The Mimbres people in a sense were along the same line but they were more like a realistic area. But his idea of insects with one running one way and you look and there’s another design where positive and negative spaces are being taken up continuously. It’s a great idea. It’s like sometimes I get carried away with my carvings, but with this new idea of using positive and negative spaces that really sounds neat. If you’ve got a small are to work with, just think what you could do with the whole area. The areas where you usually put your texture, just like a background, well that background can become a design too. I don’t think I’ve seen anybody do any positive and negative (using the mirror effect Escher has) either using the mirror effect or like where he has a bird flying one way and under his wings is another bird in the negative area”. 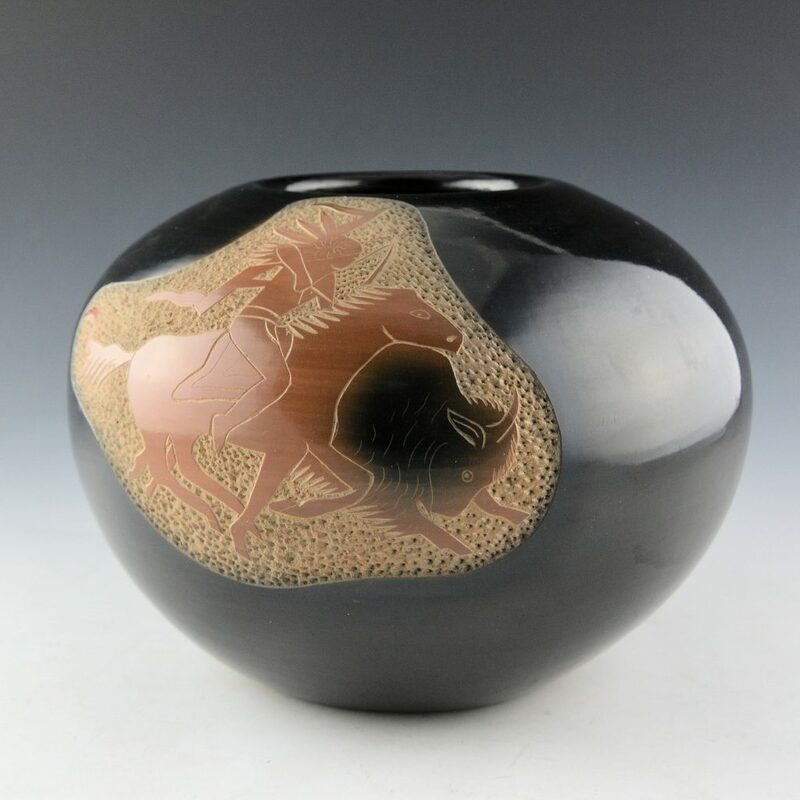 As early as 1973 Art began to “two-tone” his pieces to create a black-and-sienna coloration. 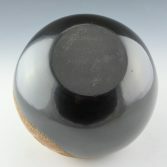 This technique was originated and then perfected by Popovi Da and Tony Da round 1968. 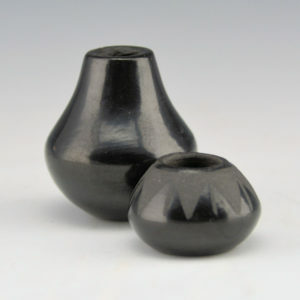 The black and sienna coloration worked nicely on both larger and smaller vessels. 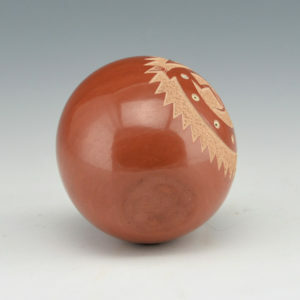 In the same way, Art also began to add stone and hei-shi beads to his pottery. 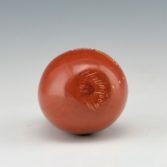 The beads were often inset as part of design, such as the eye of an animal. 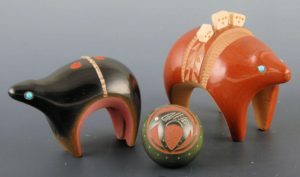 Art Cody Haungooah, Pottery utilizing various colors of clay slips. The dynamic pairing of these two artists certainly creates a fascinating yet sad story. 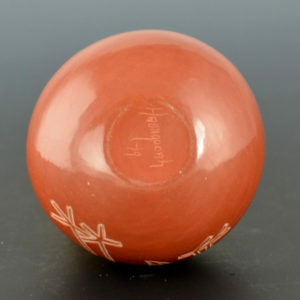 The creativity of their pottery was fresh and exciting to collectors. Sadly, Martha was struck by lightning in August, 1981 at the Puye Cliff Dwellings. A couple of years later Art remarried Brenda Tafoya. She was a daughter of Paul & Tonita Tafoya and sister of Paul Speckled Rock, Ken Tafoya, Ray Tafoya. Art, Brenda and their infant son Scotti were all killed in a car accident in September, 1985. In retrospect, it was a short career for Art and Martha, with a span of only a little bit more than decade. 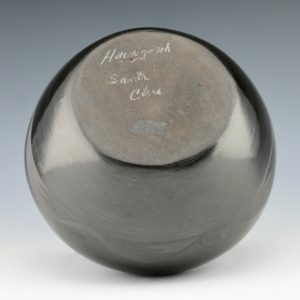 Today, their pottery legacy lives on in the work of their son, Dean Haungooah. 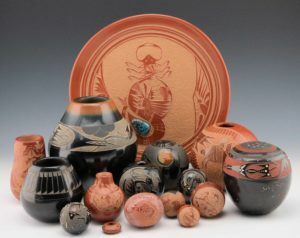 The pottery of Art and Martha can be found in museums nationwide. 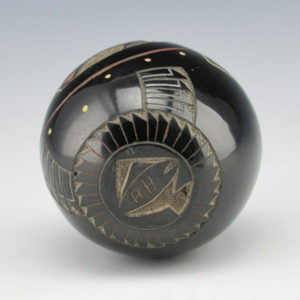 They were prolific and popular among collectors when they were making pieces. 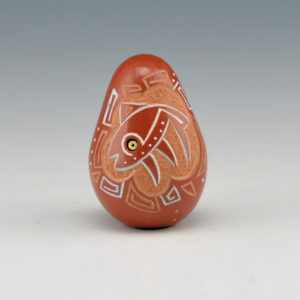 The Heard Museum, the Denver Art Museum, the Museum of Indian Art and Culture, The Eiteljorg, the National Museum of the American Indian among those who have their work as part of the permanent collection. 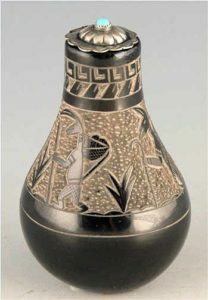 Because they mostly made miniatures, it makes those larger vessels even more scarce and unique. 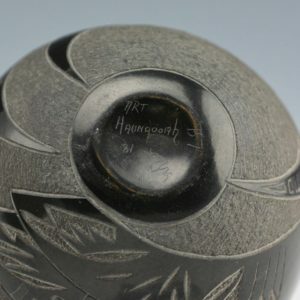 There are a variety of signatures on the pottery. They began with “Haungoah” and then it changed to “Haungooah”. In the early 1980’s he began using a fish with his initials. There are a few other variations to his signature as seen below. There are fewer pieces where they are signed by both Art and Martha. 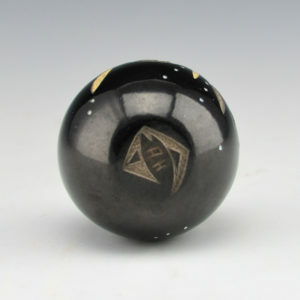 There are very few pieces signed only by Martha were made and all miniatures as we have been able to discover so far. 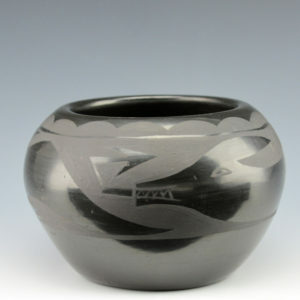 Special thanks to Ric Welch, who was a long time collector and enthusiast of Art’s pottery. Great article! I have several pieces but didn’t realize he did that many styles. I think that’s the interesting part, is that his work has been collected for decades, and it’s nice to take a look back and have some perspective on how his talent and creativity!